I recently read a post on GoPetFriendly.com that really got me thinking. The author mentioned the stories you may have seen recently about people who took their dogs on great adventures after learning their dogs were terminally ill. The post was really about living life to the fullest every moment–starting right NOW. After dealing with a life-threatening illness, surgery and chemo therapy, this post really struck a chord with me. As part of my healing, I retired early and moved to a beautiful place with few pressures left in my life. I’m doing what I love, spending time with animals, my own and my pet sitting clients’ pets. What that post really got me thinking about was my cats. Are their lives as full and rich as they could be? Dogs, to me, are easy. They are gregarious animals that love going on adventures with their humans. But what about cats? If my cats had a bucket list, what would be on it? So I started thinking about what cats like: eating, sleeping, hunting, climbing, and hiding. These were the main things that came to mind. I started assessing how I am doing in each area and how I could improve it — what I could add to their bucket list. I feed a homemade raw diet. I am constantly researching to make sure I’m feeding a nutritionally balanced diet that is the best it can be. I rotate the proteins I feed. They eat better and more exotic than I do! I know they would like me to add more treats to their list. OK, maybe. There’s lots of sleeping going on here and there are beds all over the house. I think we are good there. In spite of all the beds, they prefer to cuddle with me, at least when it is cold, so there will continue to be lots of that. The things that are left, hunting, climbing and hiding, all fall in the category of environmental enrichment and where I feel I fall a little short. Here’s where I could add some great things to their bucket list. I rarely make New Year’s resolutions because I don’t like setting myself up for failure. One thing I did decide at the beginning of the year, though, was that I would play with my cats more. I know they don’t get enough exercise. They rarely play on their own but come to life when the wand or laser toys are brought out. I’m already falling down on that since the first of the year so I need to work harder at it. They have a lot of small toys for play on their own but there are things I could do to make them more fun. I could put toys in a box with a small hole or in a bag to shake around. There are lots of great toys on the market aimed at this play drive. They have multiple cat trees and window shelves , including one that is heated. I have put a couple of shelves on the wall to give them even more vertical space. I have two more shelves that have been sitting around since last summer and a remodel I want to do on a large cat tree. Sounds like a good project for this rainy weather we’ve been having. I’ve put bird feeders at several windows and hummingbird feeders on the deck. I find it interesting that these feeders don’t see much action in the winter. When the birds are scarce, I could try one of the cat entertainment DVDs that showcase prey. They have boxes and cubes that they can hide in and there’s always the furniture to hide under in a pinch or for an ambush. Mine aren’t into hiding that much. I’ll usually find them in one of the boxes when it is chilly and they are trying to keep warm while they are sleeping. I do want to cover and decorate one of their boxes that is just a cardboard box they love. 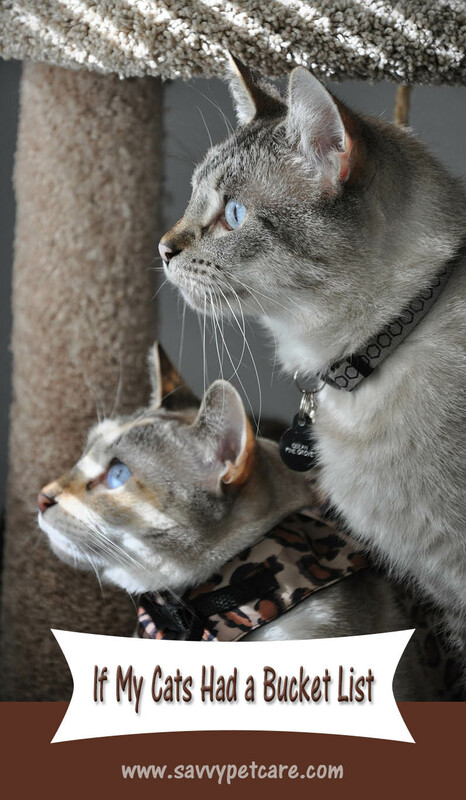 I think one of the best things I can do for my cats is to get them outdoors. I have big plans for a catio in the spring and I hope they love it. In the meantime, I bring the outdoors in by growing grass (not often enough) and occasionally giving them leaves to play with. So here’s what I think my cats would like to see on their bucket list. I’ll evaluate it periodically to see how I’m doing and what else I can add to it. That is an interesting concept. Our animals are always there caring for us and comforting us. It is neat to think about what they would want. Aww,…I will have to think about my cats’ bucket list! My husband just made them a 4 level “tree” and they love it! I should grow some cat grass for them! This is such a great post. My cats would definitely say I need to play with them more. I have done bucket lists for my dog and they include a lot of the same things. I love that you did this for your cat. Great post. I definitely need to commit more interactive play time with the girls. A marvelous post! What a treat to read. We are sharing heaps!! I love your cat’s bucket list! 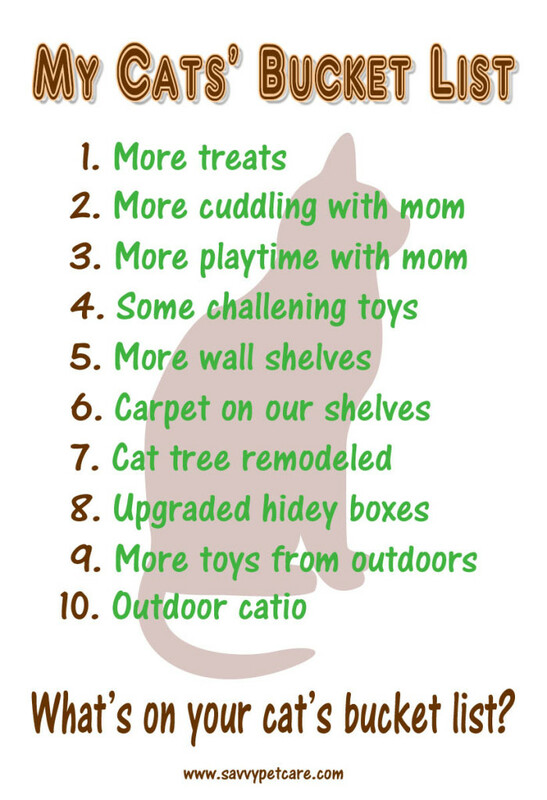 #10 is my favorite, a Catio is a brilliant idea for kitties. I’m glad you’ve reduced stress in your life, I believe that is a great healer. I’m working on my own bucket list after losing several friends way too young. It sounds like your cats have a great home. We don’t have any cats, so I’ve never thought of a cat bucket list. Super post! On our adopted (formerly feral) Binx’s bucket list? …hmmm…to go for a ride in my Jeep (he loves to climb in the window and walk all around the inside of the truck!) Maybe one day! Ricky would like me to implement this list for him. In the meantime, he wonders if he can come hang out in one of your cat trees for a vaCATion? You’re a great cat mom for really considering how to enrich their lives in special ways. A catio is a terrific way to give them outdoor time safely. I’m excited to see what you come up with! I’m finally living in a place with a secure backyard, and my dog Tashi is amazed at fact that his mom is no longer attached to his leash =) Thanks for sharing your thoughts. These kitties sound like they have a pretty good life. I don’t have a cat but my dogs’ bucket list would include more walks (they get 1 a day) and more chasing them around with their toys. I think my cat would like some fancy cat treats. I recently changed his food to one that has freeze dried raw meat in it and he seems to like that. I’m sure he’d like an outdoor catio, but that isn’t in our budget. He wasn’t a fan of the harness/leash when we tried it a while ago. More wall shelves! I loved that one best! It’s important to have play time and learning time too when you bring a pet in to your family – great post! What a great list. I think this will also be the list of my dog. Oh I want to do a bucket list for my older dog, Bruisy – I keep meaning to do this and start crossing some things off the list asap. Great post – thanks for the inspiration to get this started! Well, my cat was diagnosed with kidney disease and given about 6 months to live … two and a half years ago. So, my continued bucket list is to spend as much time as possible with her everyday. Hopefully, for years. I don’t have a cat, but if I did I think the list would look just like yours. And my dog Ted would want more treats and more walks. Um, I think all of them would want more tuna. A couple would want more bacon. ONe would just want everything I was eating. Lots more belly (a few) and chin (all) rubs. One would want me to leave the faucet on trickle all day. I’m glad they can’t make their own lists! So sweet of you to think of all these things for your cats! More play time is the more important thing for cats. We need play and stimulation. 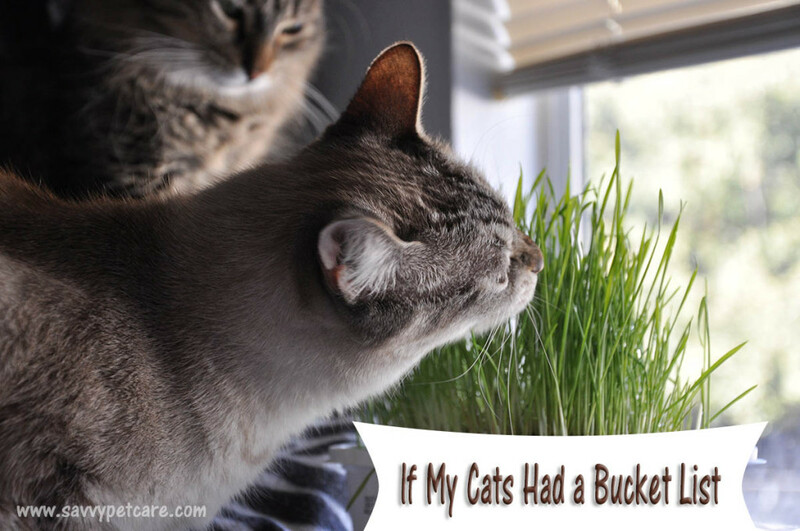 Great bucket list – we’re raw feeders too, and it’s made a huge difference to our cat’s health. Sounds like a pretty good bucket list to me! Maybe they would like some battery operated mice toys. Those are great ideas! I definitely need to get better at enrichment for my cats. My cats would request more treats, too! Great post! This is absolutely wonderful, Ava! I’m so honored that my post inspired you to this. Not having cats myself, I love the thought you’ve put into what makes your cats most happy, and then figured out some ways to enrich their lives a little more. It’s no surprise that their favorite thing is to spend time with you – playing or cuddling – so they’re pretty much like my dogs. =) Thank you for this post – you’ve made my day. And I can’t wait to see pictures of the catio! Thanks so much for this comment! I wanted to build the catio last year but it didn’t happen. Already working on the plans, so it WILL happen this year! That looks like a great bucket list! Great post. I definitely have areas that I can improve upon. Though my gang does engage in play on their own, both by themselves and together, I need to dedicate time every day to play with them myself. They love it when I do, and so do I. I think Sophie would say that she would like to go on more adventures too! I’m so hoping Christy gets to the point where she looks forward to going out!